What’s new about this new edition? There is a brand new section on writing poetry, complete with exercises, examples and recommended reading. The chapter on publishing (“After Words: The Pleasures Of Publishing”) has been completely revised and updated, as has the lists of resources for writers, including writers’ magazines and journals, books on writing and women’s poetry and fiction anthologies. Writers are not special. 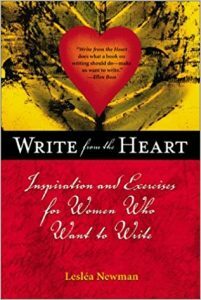 Rather every woman has the potential to be a special writer. This contradicts everything most of us have been taught. I learned early on that writers were indeed special; they were ultrasensitive, they had to be tiptoed around and handled with kid gloves. I also learned that writers were mostly male. If you happened to be female, your chances of being a successful writer increased if you were depressed, or preferably dead. When I was in a graduate writing program in 1981, there were two portraits hanging on the walls of the student writing lounge: one of Sylvia Plath and one of Anne Sexton. These two fine poets both committed suicide. While I can admire their work, they are not whom I would pick as role models. I am now my own role model. I know I don’t have to be depressed or dead or an alcoholic in an ivory tower or a junkie on skid row or any other “romantic” image of a writer in order to write. My life is quite ordinary. I get up, shower, dress, eat breakfast and sit down to write at 9:15 five mornings a week. I write all morning, break for lunch and continue writing for part of the afternoon. Around 3:30 I leave my study to do “writing errands,” which usually involves a trip to the post office, stationery store and copy shop. I come home, share dinner with my spouse and teach writing classes four nights a week. Then I read or watch TV, perhaps have a snack and go to bed. Nothing much. Absolutely everything. The stuff of my life which is ordinary, yet extraordinary. I have met many women who think they can’t be writers because their lives aren’t interesting enough to write about. This is simply untrue. Everyone’s life is mysterious, beautiful, stunning magic. It doesn’t matter if you’ve lived in the same town your whole life or traveled around the world seven times. What matters is your ability to open up to the breathtaking and spectacular adventure that happens to be your life. Your job is to experience it, see it, feel it, live it and write it down….